If you have lost your boat operator certificate and need a replacement, you must send a written request to the Alabama Marine Police. Note: There is a $5 duplicate certificate fee. Payment may be made via money order, cashier check, or certified check. Payable to: Marine Police Division. For information on your Boat Operator Certificate or to verify your information in the certification database, you may contact Lisa Miles with the Alabama Marine Police at [email protected], or call Lisa at 334-517-2942, or 1-800-272-7930 FREE. 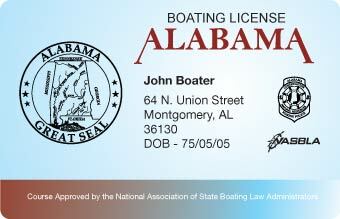 Get Your Alabama Boating License Online!